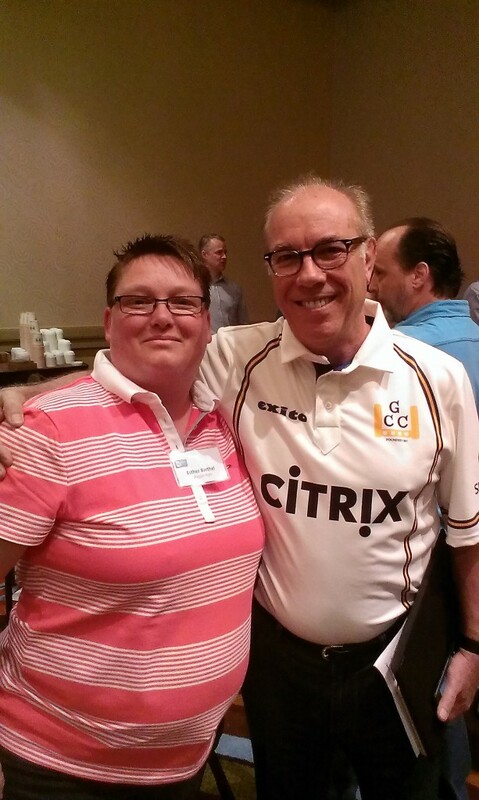 It all started over seven years ago when I got the chance to attend my first Citrix Synergy in Orlando, Florida. With only a couple of years of experience with Citrix Presentation Server 4, I was looking forward to a lot of technical sessions to extend my knowledge of the Citrix portfolio. Starting with my first keynote I felt really inspired by Mark Templeton and the Citrix vision who were making the user experience their top priority and where not afraid to use it as a measurement for the success of their products and implementations. By the end of the keynote I knew I made a smart decision to become a Citrix specialist as I really could put my heart into it and wanted to share my knowledge with the world and connect with kindred spirits out there. And now after seven years, I was able to tell Mark in person how much he inspired me to share my knowledge and share his story as well. Finally being able to say thank you in person …… and to top it off even more …… get my picture taken with Mark! How’s that for a great start of Citrix Synergy 2015?!! ← A DevOps Beginner’s Guide: What Is DevOps All About?